30 solos in a variety of styles including a set of original compositions by Michael Raven and an “off The Record” transcription of the magnificent Tarantos, a show-stopping Flamenco guitar solo of 5 minutes duration, first recorded by Mike on the LP Miscellany of Guitar Music. All the music is in staff notation and tablature. Contents include: 3 Classical Concert solos * 8 Aires and Dances * Ragtime – Valentino’s Rag * Grand Flamenco solo “off the record” transcription of Tarantos and Lamentos Mineros, first recorded by Mike on the vinyl LP A Miscellany of Guitar Music * plus easy and moderately difficult arrangements of 15 popular songs, hymns, marches and dance tunes * Jazz – Django Rheinhardt’s Nuages. 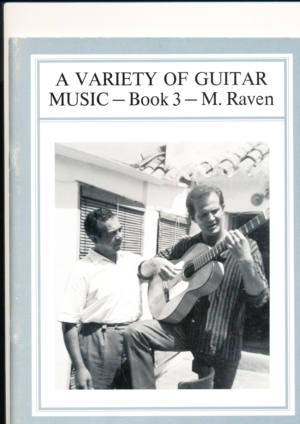 Front cover shows Michael with Spanish Flamenco guitarist, Diego Vargas in Marbella in 1965. Michael had flamenco guitar lessons from Diego for 3 weeks (during our honeymoon!). Flamenco guitarists do not write down the music so Michael had to write the Seguiryas, printed below, from memory.